This is a review of the Violent Beauty Tutu equipment for Game of War which is part of the Xenas Gear equipment set. For more info on how Inside Game of War reviews gear see here. Or for our full list of reviews see here. The Xena’s Gear set was released in December 2014 and is comprised of 5 items. They are all combat focussed and three of them include the new boost – Enemy Defense Debuff. MZ have stated these are some of the best items they have ever created, and the boosts are certainly looking very high. They primarily use standard materials which is great but the two violent items need a rare seasonal material. Silver costs are expensive to very expensive. Without any troop specific boosts or movement boosts, this item is equally suited to attacking and defending. The Troop Health boost is great, only 5% below the current best item – the Helm of Fire. The Troop Attack boost is also very strong. and this is currently the only Armor to offer it. Defensively, this is the third best combat armor. 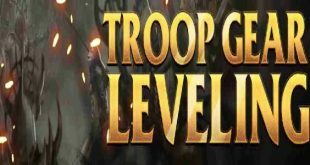 Troop Attack ad Troop Health are two of the best combat boosts and useful in nearly all situations. At just under 100mil silver this item is expensive. With two standard materials, a seasonal material and a rare seasonal material this item is hard to build. Fortunately though, the boosts make it worth the cost. This is currently one of the better combat specific items out there and one of the very best in the Armor slot. The main consideration is that you might prefer to keep your Death’s Ashes to build the excellent Reaper’s Hood.